SAN FRANCISCO, Dec. 5, 2018 /PRNewswire/ -- From Millennials to Boomers, Americans are divided on a wide range of issues today. But when it comes to expectations for customer service, they have much more in common than you might think. New research from Genesys (www.genesys.com) contradicts the widely touted differences between digital natives and their older counterparts. There remain distinct differences in the customer communication preferences of younger and older generations, but the gap is narrowing as age groups bind together in their shared irritations. 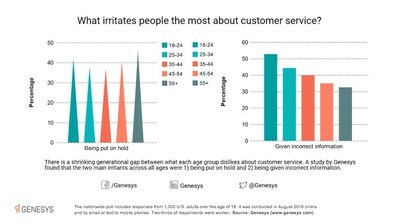 According to a recent nation-wide survey of 1,000 adult respondents, all age groups reported they found the most success resolving their latest customer support issue through a contact center (33% and up), although 26% of those under age 35 reported finding answers to questions through an online search. The vast majority of respondents steer clear of social media when it comes to contacting customer service. In fact, only 3% to 6% of respondents cited social media as their preferred communication channel. A majority in each age group (from 30% to 45%) also believe small, independent "mom-and-pop" stores provide the best customer service. Large corporations came in second, with 21% of respondents between ages 25 and 44 preferring their manner of customer service. The poll found there are two main irritants about customer service which span all age groups – being given incorrect information and being put on hold. For ages 34 and under, receiving incorrect information is the main problem, while being placed on hold ranked second. For the 35-to-44-year-olds, the two irritants are about equally annoying. After age 45, as time becomes more precious, the results flip and being put on hold ranks as the main nuisance. "For many years, conventional wisdom taught us that there were stark divisions between how people of different generations wanted to interact with businesses," said Janelle Dieken, senior vice president of product marketing at Genesys. "However, our survey indicates that communication preferences of digital natives and other age brackets are surprisingly similar. Consumers, regardless of age, want a blended approach. They like the human touch, but they also appreciate the rapid access digital channels, automation and artificial intelligence (AI) enable." Across all age groups, "low price" is the reason people will continue to tolerate a company that offers bad service. But there are differences in the value these groups put on low pricing, with it being the most important (64%) for respondents under age 24, while pricing holds the least sway over those over age 55 (36%). Further, even with the fickle reputation of younger generations, the research shows this age group is more inclined to continue doing business with a company when confronted with poor service compared to their older counterparts. In fact, nearly 33% of 25-to-34-year-olds cite long-time brand loyalty as the reason they stay with a provider despite bad service. While only 17% of the older cohort, those 55-and-over, reported loyalty as the reason they put up with bad service. In addition, those over the age of 25 reported the best customer service is provided in-person. On the other hand, 18-to-24-year-olds still appreciate the human touch, but believe speaking to a live agent over the phone is sufficient enough to address their concerns. 10 minutes is the maximum amount of time respondents of all ages are willing to wait on hold, no matter whether making a customer service inquiry or a complaint. Those under age 35 are willing to pay more to ensure better customer service while those over age 35 are not, with the gap becoming wider as people age. Respondents age 55 and older dislike having too many automated options before reaching a customer service agent. Social media and video chat are the least popular methods for interaction with a business, with video chat the least popular method for the 18-to-24-year-olds, and social media cited as the least popular for those over age 45. The 25-to-34-year-old age group is the only cohort that reported they are more likely to go into physical stores on Black Friday (60% Yes; 40% No). Black Friday shopping is least attractive to the age group who have the most experience – only 25% of those aged 55 visit stores. The nationwide poll included responses from 1,000 U.S. adults over the age of 18 and was conducted online and by email or text to mobile phones in August. Two-thirds of respondents were women. ©2018 Genesys Telecommunications Laboratories, Inc. All rights reserved. Genesys and the Genesys logo are trademarks and/or registered trademarks of Genesys. All other company names and logos may be registered trademarks or trademarks of their respective companies.